One of the hard things about college, especially as a business student, is that everyone feels pressure. Pressure to get the best GPA, to get multiple internships, to get a stellar job offer- the list goes on. If you say this doesn’t apply to you, I envy you. (And I also wonder what college you go to…) I’ve spent a better part of my college career trying to get one specific internship, at a local digital advertising agency. I’ve dubbed it my ‘dream internship’ ever since I first encountered the company and have been consistently chasing after it ever since (second semester of freshman year, to be exact). Well, I’m now a junior and I finally did it: I scored my dream internship. This post isn’t intended to brag about my accomplishment, but to share my experience in an attempt to help others. 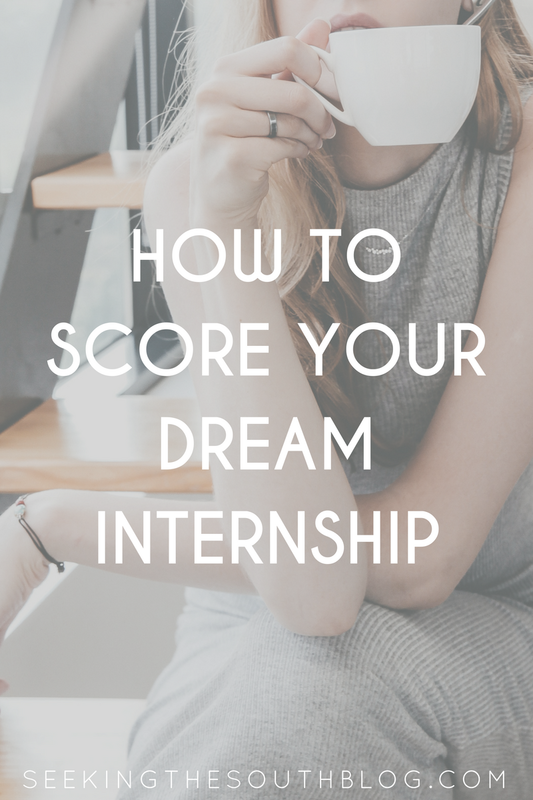 Here’s how I scored this internship. It may help you, it may not, but all of this advice is relevant to getting any and all internships and jobs you may be interested in. Like I said, I spent a better half of my college career chasing after this internship dream. So that means I’ve been at it a while. I’ve been through three different interview processes (I guess third time really was the charm), talked to at least twelve different employees throughout the interview process and emailed the recruiter more than a dozen times. My point is that I was consistent. I literally did not let them forget my name. Every time they came to campus for career fairs, I was there. (In fact, the most recent career fair, I was so familiar with them, I was greeted with “Hi Emma” from three employees working the booth.) Once I was denied from one internship “session” (i.e. the Spring internship), I would wait a couple of months, then apply for the summer internship. It did get a little disheartening at some points. I felt like all I was doing was getting rejected, or that I was truly wasting my time, but I kept on keeping on. You know how at the interviews they ask if you have any questions? Sometimes during my interview process, I would almost laugh at this question because I had so thoroughly stalked the company that I felt I knew absolutely everything. (Obviously, I didn’t, so I would still come up with a question, as you should in every interview, but still.) This doesn’t mean just reading over their website before heading over for your interview. This means treating your interview as if you are about to be quizzed on your potential employer. Stalk every single page of their website. Stalk all of their social media. Search recent news about the company. Know any awards they might’ve just won. If they’re a B2B (business-to-business) company, know their clients. Know precisely what they do. If you know who you’re interviewing with, stalk them on LinkedIn. Know where they went to school, how long they’ve been with the company, etc. (This will make interviewing with them easier if you know potential common ground!) Something some might forget, is to research the culture of the company. An odd, but common mistake (according to my father, an advertiser) is to not dress the part. For an advertising firm (well, most of them), showing up in a full suit is usually a big no-no. But for a big financial firm, showing up in jeans is a no-no. Know what is the expected dress code, and if you have absolutely no idea, ask someone in the industry. To sum it up, you should feel like a freaking expert on this company when you walk into their office. This will not only impress your interviewers, but it will show you truly care about this company and didn’t just randomly find it online. If you know anything about interviews, you should know that you always thank your interviewer afterward. The most impressive form is a handwritten thank you note, but unfortunately I, and most people, don’t have a lot of time to hand deliver this. (Mailing would work, too, but the faster the delivery, the better.) I opted for the classic email thank you approach. The key to this is to make the email memorable. One way to do this is to mention specific things you talked about in your interview. This email should be sent out no later than the morning after the interview, but preferably the evening directly following the interview (so it’s waiting in their inbox in the morning). It seems like a small gesture, but it goes a long way in the long run. In the business world, it’s all about who you know. Your GPA could be stellar and your experience impressive, but if no one is there to back you up, chances are you’re going to be left in the dust. I might not have known anyone at my particular company when I was introduced to it, but I quickly changed that. My best resource during my process was another, older student that was a current intern at the company. I met him at an unrelated event at the business school and he mentioned his current internship. I knew I needed to connect with this guy immediately. I simply asked him later, via email, to get coffee and chat about his experience. When you do this, people will rarely deny you. People love talking about themselves, it’s a fact. But people also love when you put in effort like this, so they feel the need to reciprocate your effort with their time. I could not be more thankful for this person, that I now consider a friend for getting me to where I am now. I’m not saying this guy got me my internship, but I know for a fact that he personally delivered a hard copy of my resume to the recruiter at the company, a simple gesture, but a huge deal. Did I stop at this one connection? Absolutely not. Any chance I got, I would make a connection. If I heard of a friend of a friend that worked there, I’d get their contact information. Every time I connected with a person, I made sure to not let them forget my name. I connected with every single person on LinkedIn, and would often email them later on in my process. I probably annoyed some people, but it was totally worth it, obviously. I’ve now been interning at the company for about three months and I’ve learned more than I ever could have imagined. I can honestly say the work was worth it because I cannot imagine getting this experience anywhere else. I highly encourage anyone applying for their dream internship to never give up. In the end, it will all work out. What’s your internship experience? I’d love to hear some stories below! If you have any questions about interviews or internships, feel free to reach out to me via email, or follow me on Twitter, Pinterest, Bloglovin’ and Instagram!